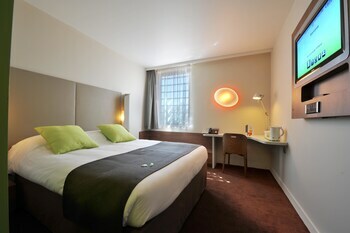 With a stay at CAMPANILE LYON SUD - Confluence - Oullins in Oullins, you'll be connected to the convention center and convenient to Gerland Sports Palace and Stade Gerland. This hotel is within close proximity of Lyon Aquarium and Halle Tony Garnier. Make yourself at home in one of the 123 air-conditioned rooms featuring LED televisions. Complimentary wired and wireless Internet access keeps you connected, and satellite programming provides entertainment. Private bathrooms with bathtubs or showers feature rainfall showerheads and complimentary toiletries. Conveniences include phones, as well as desks and coffee/tea makers. Satisfy your appetite at the hotel's restaurant, which serves lunch and dinner, or grab a snack at a coffee shop/café. Quench your thirst with your favorite drink at a bar/lounge. Buffet breakfasts are available daily from 6 AM to 9 AM for a fee. Featured amenities include complimentary newspapers in the lobby, a 24-hour front desk, and multilingual staff. Planning an event in Oullins? This hotel has 1346 square feet (125 square meters) of space consisting of conference space and meeting rooms. Self parking (subject to charges) is available onsite. Campanile Lyon Sud Confluence Oullins Oullins is an ideal Oullins lodging choice for your trip to France. With numerous amenities for guests such as 24 hour front desk, non-smoking facility, lounge/bar, you will wake up at Campanile Lyon Sud Confluence Oullins Oullins feeling excited every day for your time in Oullins. Don’t let this amazing reservation opportunity pass you by, book your stay at Campanile Lyon Sud Confluence Oullins Oullins today to make the most of your time in Oullins, France.